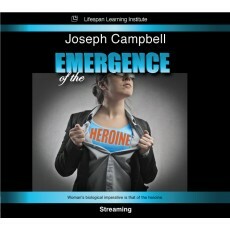 " In this video presentation Joseph Campbell gives a brilliant and all encompassing summary of the female archetype as a heroine is expressed over millions of years of art, archeological artifacts, and social ritual.Hero is defined simply as one who sacrifices one's life for another. He states that "womanhood in its very biological base is heroic" in the service of nature. He demonstrates this through exploring the evolutionary and social development of both men and women, linking a multitude of archeological artifacts, and social rituals drawn from the prehistoric period through to Christian and Buddhist representations of the mother-goddess."